The High Line was built in the 1930s, as part of a massive public-private infrastructure project called the West Side Improvement. It lifted freight traffic 30 feet in the air, removing dangerous trains from the streets of Manhattan's largest industrial district. No trains have run on the High Line since 1980. Friends of the High Line, a community-based non-profit group, formed in 1999 when the historic structure was under threat of demolition. 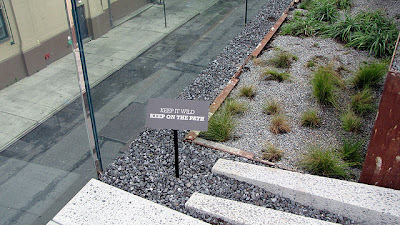 Friends of the High Line works in partnership with the City of New York to preserve and maintain the structure as an elevated public park. To see the photos view my High Line Flickr Set. Kudos for staying a step ahead! Cool! The High Line is all I've heard about since this weekend. It's definitely worth a visit if you're in NYC. If it had free wi-fi I'd go everyday.